This freebie includes 4 pages of cards that can be used to make a Story Elements Chart. There are a variety of Characters, Settings, Problems and Solutions and students will need to distinguish between these in order to add them to the correct place on the chart. 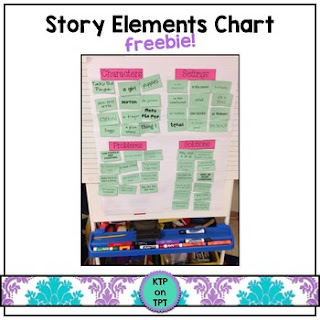 There is also a Story Map that can be used for brainstorming before writing a short story. I hope you enjoy the freebie!! • Please go to your My Purchases page (you may need to login). Beside each purchase you'll see a Provide Feedback button. Simply click it and you will be taken to a page where you can give a quick rating and leave a short comment for the product. I value your feedback greatly and honest feedback helps me create better products. If you have a download or printing issue, please email me at KTPonTPT@gmail.com BEFORE leaving feedback. I am more than happy to do everything I can to solve any problems or fix any issues for you! • Look for the red star near the top of any page within my store and click it to become a follower. You will now receive customized email updates about this store. I love new followers! !